This is a resource page for the media during a winter weather event. 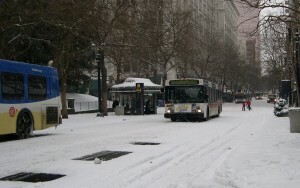 It provides the media insight into TriMet’s operations during inclement weather and has tips to share with audiences about riding transit during snow and ice. Members of the public should go to trimet.org/winterweather for customer-facing advice and visit trimet.org/alerts for service alerts. Media should email the TriMet PIO team and call the TriMet media duty pager for additional information or to request an interview. TriMet plays a critical role keeping the region moving. During inclement weather, our most important principle is safety over schedules. We work diligently to get riders safely to their destinations. However, if it’s not safe for our operators, riders or equipment, TriMet will alter service. That may mean putting a bus line on snow route, altering a bus route or MAX line, or canceling a limited run bus line entirely. View snow routes. 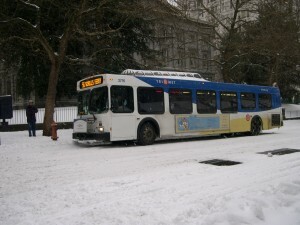 TriMet partners with the Oregon Department of Transportation, the City of Portland and jurisdictions throughout the region for their help to keep transit moving during a storm. TriMet has worked with these partners to make our busiest bus routes a priority for snow plowing and sanding. TriMet managers and operations staff closely monitor weather reports as a storm moves in, and coordinate with local partners to keep the roads open so buses and trains can operate. We have employees working around the clock to chain buses, prepare equipment and assess higher elevation routes. TriMet even has a few of its own sanding trucks and other equipment to augment the resources of our local and state transportation partners. 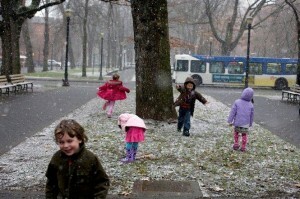 During major weather events, TriMet activates our Emergency Operations Coordination. Additional staff work around the clock during a major storm to provide safe operations and communicate with our riders. 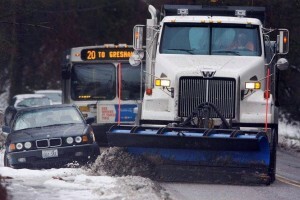 TriMet also coordinates with city, county and state emergency managers to assess the status of the region’s roads and identify needed resources, including street plowing, sanding and towing priorities. During a snow or ice event, TriMet crews will go out in the early morning hours to check bus routes in higher elevation areas. They determine if it is safe to operate regular routes or if any routes need to be altered. These “snowbirds”, as we call them, coordinate with city crews for sanding needs. They may also call for a TriMet sanding truck. TriMet has three sanding trucks – one assigned to each of our bus maintenance facilities. We augment city sanding efforts in key spots as needed to keep the buses moving. Buses face the same road conditions as other vehicles. If streets become impacted by snow or ice, buses will run slower and can be delayed. If it is not safe for our operators, riders or equipment, TriMet will alter service in an area. TriMet crews focus on getting our vehicles ready to provide service for our riders. As they get very busy, and for safety at our operating facilities, we no longer allow media to record chaining operations. Call the duty pager to request a copy of the video in broadcast quality. TriMet now has more than 411 buses – or more than 60 percent of our fleet – equipped with automatic drop-down chains. The operator deploys the chains with a push of a button when extra traction is needed. These are the same type of chains used on many school buses. While the drop-down chains are helpful in light snow and can give us time, should snow move in quicker than forecast, crews will install the more heavy-duty chains on all buses for most snow events. Call the duty pager to request a copy of the video. Depending on the forecast, either a portion of the bus fleet will be chained by maintenance workers or the entire fleet will be chained. We stock up at least four sets of chains per bus for the winters season. That adds up to about 2,680 sets of chains. Chaining takes place at each of TriMet’s three garages. It takes 10 minutes to chain a bus at the garage or 15 minutes in the field. It takes eight to 10 hours to chain the entire fleet. Call the media duty pager to request a copy of the video in broadcast quality. Buses with chains can travel at a maximum of 25 mph, which means buses will not be on schedule, but the focus is to keep them moving, and do so safely. In extreme cold temperatures, buses may idle overnight to keep engines warm and prevent air systems from freezing. Brakes, doors, wipers and starters are all air operated. When roads are snowy or icy, bus operators will not pull the vehicle all the way over to the curb, to avoid getting stuck. Accommodations will be made to assist riders with mobility devices. See more Tips for Riders. Bus rescue teams are on standby and are deployed to get stuck buses moving again, repair or replace broken chains or chain buses in the field. TriMet also has on-call contracts with towing companies to assist further. MAX typically runs well in snow, though trains can be delayed because of stuck autos, debris or downed commercial power lines blocking the tracks . Freezing rain also can cause problems if ice begins to build up on the overhead wires and trains cannot get the power to move. If conditions in an area are affecting roads and utilities, we will alter MAX service to keep trains running. This may mean added transfers and extra time for trips. Riders should plan extra time and dress for the conditions. Learn more about possible MAX adjustments during severe weather. The MAX system has rail-switch covers, nearly half with heaters, to prevent snow and ice accumulation on the switches. Ice caps, hard plastic caps that covers a portion of the overhead wire, are along nearly all MAX lines east of the Willamette River and at both rail yards. If necessary, a few trains will run after normal operating hours on the entire 60-mile system to keep ice from accumulating on the overhead power line. In most cases, riders may be able to board trains during these off hours. When snow and ice falls, TriMet crews will clear small paths on platforms, stairs and transit center sidewalks to help riders get safely to trains and buses. However, with more than 100 rail stations, it will take time for us to reach each one. Riders should use caution in slippery conditions both at TriMet facilities and making their way to and from stations and bus stops. TriMet staff will apply anti-icing liquid, Magnesium Chloride (MgCl2), on walkways/stairs at MAX platforms, transit centers, park and rides and other places prone to ice buildup. It is the same liquid that the Portland Bureau of Transportation and other transportation agencies in the region use for roads and bridges. The fluid prevents ice and snow from bonding to the surface, but it has to be applied to a dry surface before snow or ice falls. MgCl2 is environmentally friendly and biodegradable. 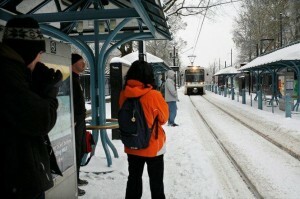 During snow and ice, TriMet often sees riders new to the system. It is always important for riders to check trimet.org/alerts before they go for alerts about service adjustments, and they should be prepared for walking and waiting in winter weather. Dress warmly and stay visible. For buses, wave to the operator and carry a small flashlight or strobe, but please do not shine it into the operator’s eyes. Wait on flat ground: if your bus stop is on a hill, walk to the bottom or top as the bus cannot stop on a slope. Stand on the curb until the bus comes to a complete stop. Buses will not pull to the curb to prevent getting stuck. You may have to step into the road to board. Accommodations will be made to assist riders with mobility devices. Check the status of a bus or train before you leave the house by visiting trimet.org/alerts. During snow or ice conditions, buses and trains may get so far off their normal schedule or route that TransitTracker can’t predict real-time arrivals accurately. Instead of an arrival countdown, we’ll show how far away the next vehicle is using “miles away”. Knowing how far away your bus or train is helps “see” it getting closer. Learn more about how TransitTracker works. TriMet’s Rider Support team provides live trip planning help seven days a week between 7:30 a.m. and 5:30 p.m. at 503-238-RIDE (7433), and 24 hours a day on Twitter at @trimethelp and by text at 503-238-7433.